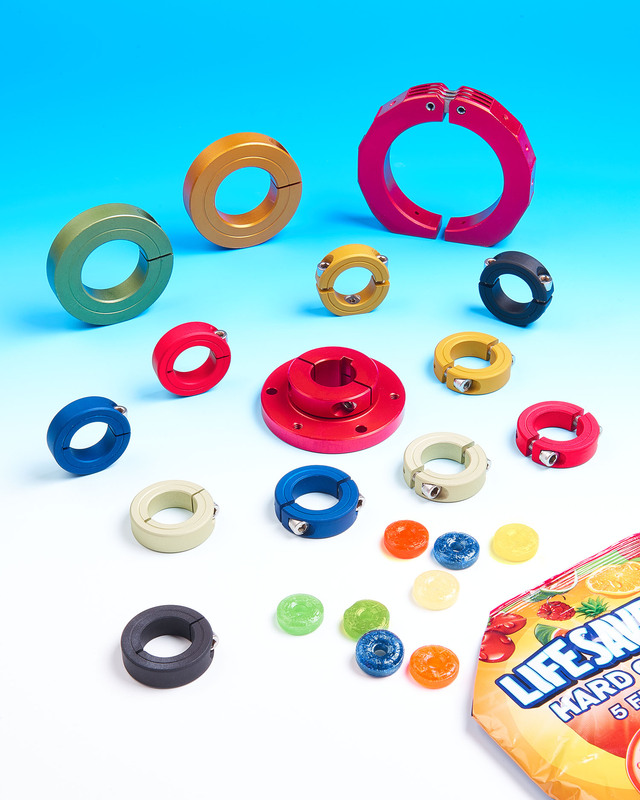 Anodized aluminum shaft collars and mounting devices offered in permanent bright colors to enhance the appearance of products, equipment, and machinery and increase safety by color-coding switches and fittings are available from Stafford Manufacturing Corp. of Wilmington, Massachusetts. Stafford Anodized Aluminum Shaft Collars and Mounts provide OEMs and system designers with the ability to select and custom match colors to enhance the aesthetics and branding of their products, equipment, and machinery. They also permit the color-coding switches, fittings, and replacement parts which is especially effective for fail-safe or critical applications. Functionally equivalent to standard clamping collars, Stafford Anodized Aluminum Shaft Collars and Mounts are available in sizes from 1/8” to 6” I.D. with smooth bores to protect shafts, tubes, and pipes. Featuring one- and two-piece, and hinged styles, collars also can incorporate flange mounts and special bores, face, and O.D. treatments such flats, holes, and knurls. Stafford Anodized Aluminum Shaft Collars and Mounts are priced according to size, design requirements, and quantity. Pricing is available upon request.